As a group, the party decided to return to West Leedshire and confront Cpatain Hiller. Once they arrived at the garrison they were informed that only Audrey and Ander could enter to see Hiller. Reluctantly the two entered while their allies waited outside. Once inside Audrey and Ander surrendered their weapons and entered Hiller's chambers. Inside they were met by Hiller and two of his lackey watchmen. Offering them a drink they sat down to discuss the situation. Hiller used Ander's current status as a wanted criminal as leverage his position, informing Ander that, at the moment, he was intercepting his bounty postings, and that only he and his closest men were aware of the situation. If Ander and Audrey were willing to act on his behalf to perform certain duties that would be frowned upon coming from a watchman, he'd make sure that no bounty board in the area would see Ander's bounty sheet. Apparently Captain Hiller also has operatives in Leedshire that would intercept the sheets as long as Ander and Audrey cooperated. With that, Hiller told the two what he needed done—or rather what his employer needed done, never revealing who that was. A wealthy collector of rare and ancient items living in Leedshire was in possession of a large, ancient iron key. He showed them an artist's rendering, as well as an actual charcoal relief of the key itself so that Audrey and Ander knew what exactly they were looking for. Hiller didn't give them much more information other than where the collector—a man by the name of Gower Taubert—resided in Leedshire, and that on the 27th he'd make sure that his men in the local watch would be on patrol in the area. He reassured them if they saw any watchmen in te the area they'd turn a blind eye to anything that they might have to do to gain entry into Gower's guarded property. Agreeing to the conditions Audrey and Ander left Hiller's garrison and returned to their waiting allies and filled them in on what was going on then headed back home for the rest of the day. The next day the party woke to a raging rain storm. Despite the terrible weather conditions they decided to set out to make the day long journey into Leedshire so they could spend a day scouting the area out. Loading into their cart, pulled by their faithful old horse Gerald, they set out onto the muddy road to Leedshire. At about noon, as Gerald slogged through the mud and rain, a large figure flanked by two man-sized could be seen standing on the road ahead of them in the hard rain. Realizing this was most likely trouble, those on the cart leapt off to find cover—but walked right into an ambush. As Ander moved to the side of the road to find cover, he was greeted by a goblin's arrow. Suddenly, several goblins armed with short bows leapt from bushes and tree branches firing down on the party. Once the attack started the ogre and his two orc allies rushed down the road towards the party to engage them. Due to the heavy rain and strong winds, most ranged attacks were futile, but one arrow managed to find its mark: Gerald the horse. Gerald's legs buckled as he fell into the mud, slowly dying from the wound. Grabby managed to engage some of the goblins by sneaking up on them and cutting their throats while Ander, Audrey and Broak engaged the other in melee. Broak took the ogre head-on. As the ogre swung its massive mace at Broak, an orc moved into flank the dwarf. 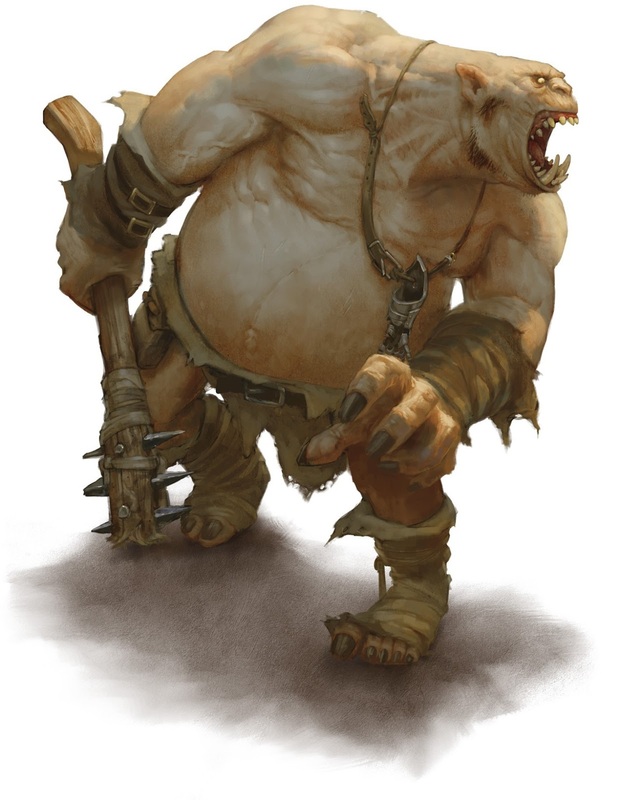 As the ogre was staggered and off balance from his attack, Broak saw an opening and manged to strike the ogre in the side of the head with a critical hit, stunning him. But due to the nature of Broak's warhammer, he once again experienced the killing blow to his lover, falling to his knees screaming in emotional anguish. Now, in the middle of the battle, both Broak and the ogre stood stunned before one another. Once close enough, Boots cast a charm person spell on the ogre, taking over the brute's simple mind as it recovered from Broak's stunning blow—and then quickly ran behind the ogre to get cover and commanding the ogre, "Old friend! attack those orcs and the goblins! Protect us!" Which it did. As an orc engaged Ander in combat, the ogre rushed up behind the orc and slammed his mace into the unsuspecting creature, killing it instantly. At this point only a single goblin remained, who quickly leapt from his tree and dashed off into the wilderness defeated. Ander quickly moved into heal Gerald so the horse could continue the journey into Leedshire. Boots thanked the ogre for his service, wished him well and sent him on his way as they departed for Leedshire.